Since I was able to verify that the fuel tanks don’t leak like a sieve, the next step was to pump fuel through the fuel lines and totalizer, to flush out any junk, test the totalizer and make sure it was talking to the Dynon Skyview. Mission accomplished. Both sides tested and everything appears to be plumbed correctly. 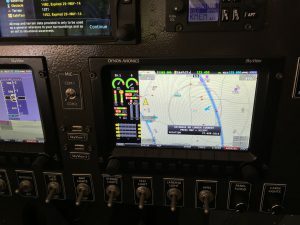 No fuel odor detected. The Airflow Performance fuel pump was able to maintain between 39-40 gph the whole time. I pumped about 4 gals through each side. I pulled the fuel filters expecting to see some junk, but there was nothing in the filter. I guess I can’t complain. 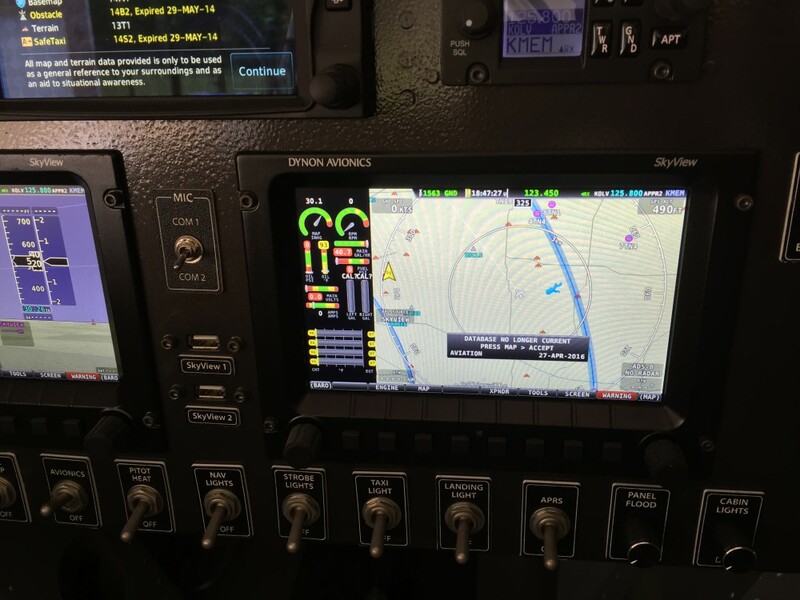 This entry was posted in Engine and Firewall Forward on June 26, 2016 by Mark Dickens. So, I wanted to test my fuel tanks before mounting them to the fuselage since it’s been only since 1999 since they were built. 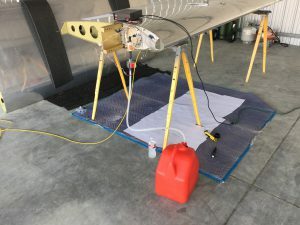 As the photos show, I set up each wing on sawhorses, grounded the wing, plugged the fuel tank outlet and quick drain, and added 10 gallons of avgas to the tank. I spread copier paper out under the tanks to catch any leaks and hopefully show blue stains if there were leaks. Bottom line is that no leaks were detected after leaving the tanks unattended for more than 24 hours. 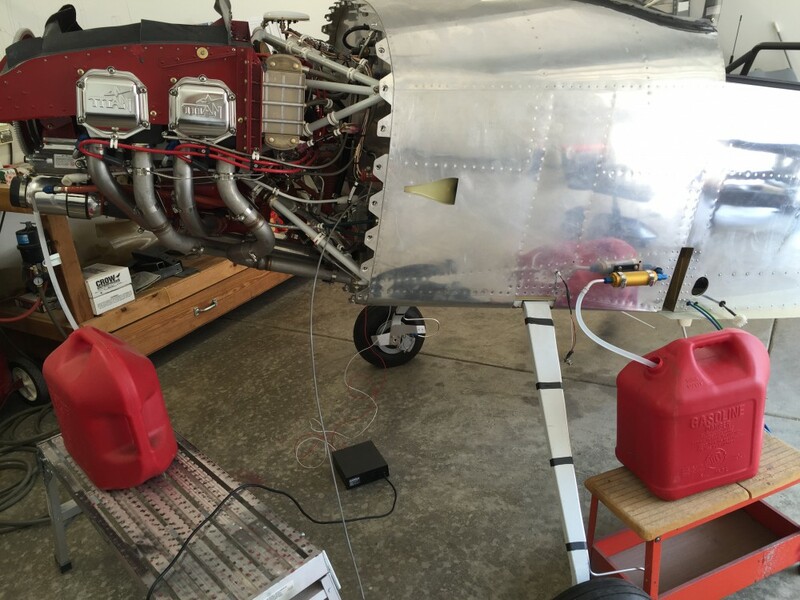 I then pumped the avgas back into gas cans using a small Facet fuel pump and filter. Nothing was caught in the filter. 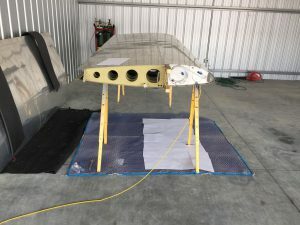 As far as I can tell, the tanks are ready for mounting on the fuselage. This entry was posted in Wings on June 21, 2016 by Mark Dickens. I decided to replace the tubes, re-pack the bearings and generally check out the landing gear. Even though the plane hasn’t flown, I was leery of the age of the tubes and decided to prophylactically change them just for peace of mind. I changed them to a set of Michelin Airstop tubes from Spruce and repacked the bearings with Aeroshell 22 grease. 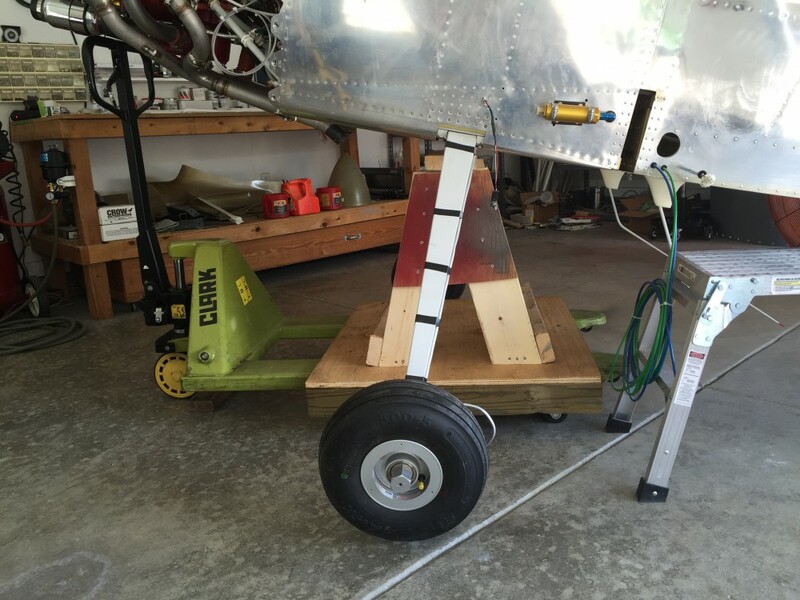 Since the plane is on its gear and the engine is mounted, etc, I had to find a safe and sturdy way to lift it up for these activities. My company owns a pallet jack and I conceived of an “A Frame” support, which is mounted on a “pallet”. 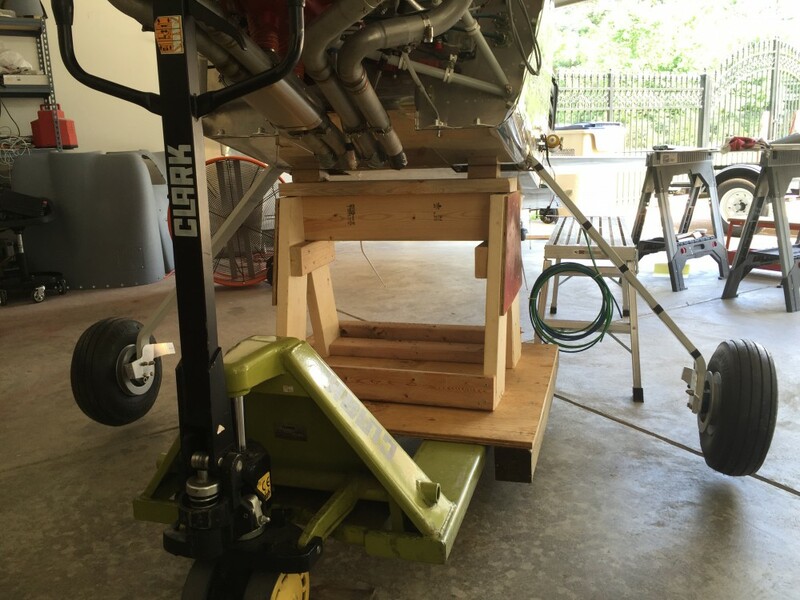 The pallet jack serves as the lifting mechanism and the “A Frame” support is mounted directly under the gear boxes. All pressure is upward and applied to the steel mount. Worked out beautifully and I plan to buy a pallet jack for the hangar. 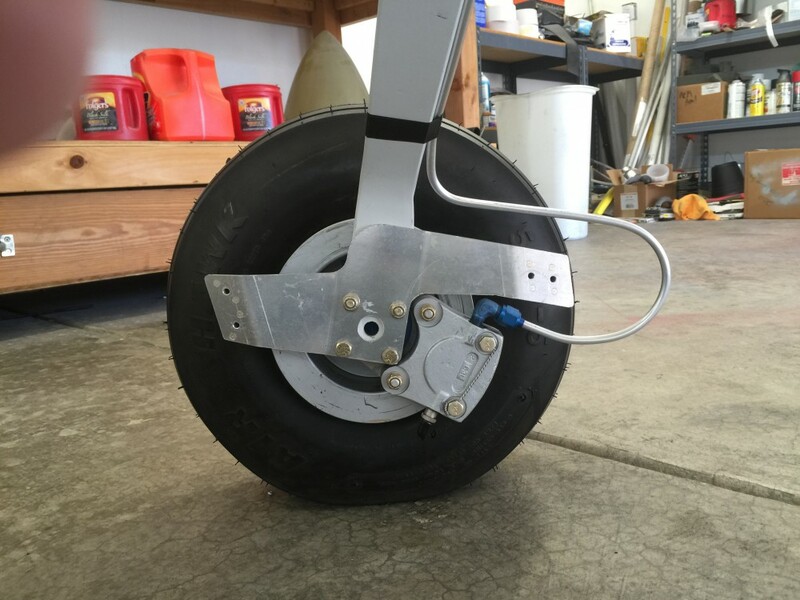 While I had everything off, I decided to drill some 3/4″ holes in the wheel pant bracket in order to expose the 7/16″ holes in the landing gear. Insert a shortened 7/16″ bolt in that hole and you have a sturdy way to jack the wheel off the floor with a scissors jack. This entry was posted in Fuselage on June 16, 2016 by Mark Dickens. I borrowed the company trailer and with the help of my son William, we hauled the wings to the hangar. 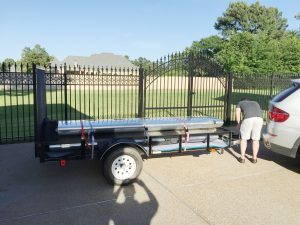 They were laid flat on moving blankets with closed cell foam in between them, and then securely strapped down for the 25 minute ride. All arrived in good shape! This entry was posted in Wings on June 7, 2016 by Mark Dickens.